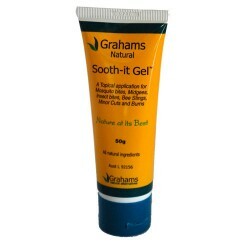 Sooth-it gel is a topical application designed specifically to relieve the discomfort of insect bites and stings as well as relief from minor cuts and burns. This non-irritating formula is safe to use on all ages and on those with sensitive skin. A great natural alternative to Stingoes. Centella Asiatica ext, Calendula ext., Manuka Honey, Chamomile, Emu Oil, Witch Hazel, Aloe Vera, Allantoin (Comfrey). As with any product being used for the first time the Sooth-it Gel should be patch tested before use.